In Rome, there are a total of 8 Egyptian and 5 Roman obelisks. 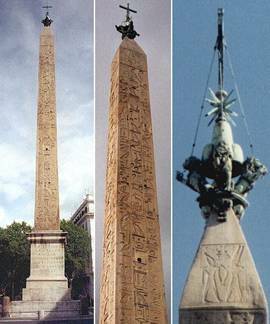 In the context of this article, we will focus on four obelisks that were re-erected by Pope Sixtus V. Around 1587, all of Rome’s obelisks were toppled down and it was Pope Sixtus V who started re-erecting four of the fallen obelisks in Rome. Pope Sixtus V also redesigned the Piazza in front of the Saint Peter Basilica that was itself under construction at the time. The current oval shaped piazza with the obelisk at the Vatican was designed and built at the orders of Pope Sixtus V. It was part of an overall urban redesign of the city of Rome in which four of the obelisks were given new locations. 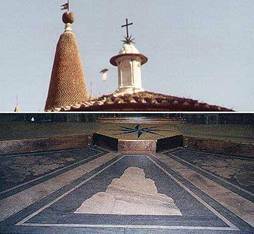 These four new locations were centered around the obelisk at St. Peter’s Square which became the focal point. The first Egyptian obelisk was originally shipped by Emperor Augustus in 10 BC from Heliopolis, Egypt (dedicated to Seti I/ Ramesses II) to the Circus Maximus in Rome. Circus Maximus was a Roman hippodrome used for chariot racing. The obelisk was moved by Sixtus V from Circus Maximus to Piazza del Popolo where it still resides today. The second Egyptian obelisk was originally shipped from Thebes (temple of Amun, Tuthmosis IV) to Circus Maximus in Rome by Constantine II the son of Constantine the Great. The initial plans to ship the obelisk to Circus Maximus (Latin for the greatest circus) in Rome however were made by Contantine the Great who didn’t have the facilities to actually ship the largest of the Egyptian obelisks (32.18 m tall) to Rome. Eventually, his son succeeded in carrying out his father plans. Both obelisks were placed on the Spina of Circus Maximus. The Spina (backbone) is a 217 meter long wall in the centre of the hippodrome. This obelisk was moved by Pope Sixtus V from Circus Maximus to Piazza di San Giovanni (Laterno) next to the Basilica of San Giovanni. The third Egyptian obelisk was originally moved to Rome in 37 AD by Emperor Caligula and situated at the Vatican Circus. The origin of this obelisk is unclear. It’s the only obelisk without hieroglyphs. This obelisk was again relocated by Sixtus V to St. Peter’s Square where it is seen today. The fourth and last obelisk is a Roman obelisk that originally stood in Mausoleum of Augustus and was moved by Sixtus V to the piazza in front of the Basilica of Santa Maria Maggiore at the Piazza del Esquillino. What is interesting in the context of this article are the before and after locations of these obelisks in the overall urban redesign plan of Pope Sixtus V.
Circus Maximus, for instance, was built in a bend on the bank of the River Tiber, and on a Winter Solstice day the Sun would be seen rising over the Tiber River in line with both obelisks at the Spina when viewed from the Vatican. Pope Sixtus V could have restored Circus Maximus and placed the obelisks at their original locations. It’s interesting to notice that viewed from the St. Peter’s Square these obelisks would be aligned with the Winter Solstice Sun! This is because St. Peter’s Square lies exactly in line with Circus Maximus and the Winter Solstice Sun. Instead, Sixtus had chosen to relocate one of the obelisks of Circus Maximus to the Piazza del Popolo. Like the Equinox Sun, the summer solstice Sun is seen rising over the River Tiber from St. Peter’s Square since the obelisk at the Piazza del Popolo is situated only two blocks away from the river. The other obelisk of Circus Maximus was Rome’s tallest obelisk and was moved to the Piazza di San Giovanni in Laterno (in southeast direction from the Vatican) which resides at an azimuth of 114° 0’ which is 9 degrees off the Winter Solstice sunrise azimuth of 123° for Rome. While both obelisks in Circus Maximus originally aligned to the Winter Solstice, Pope Sixtus V deliberately altered these alignments and made sure that one of the obelisks now aligned with the Summer Solstice Sun. The other obelisk that previously aligned to the Winter Solstice Sun was now deliberately misaligned. It’s obvious that the alignment of both the obelisk at St. Peter’s Square and the obelisk at Piazza del Popolo must have been intentional since both obelisks were put there by Sixtus V. While he could have chosen for a Winter Solstice alignment of St. Peter’s Square obelisk by erecting the other obelisk at Cricus Maximus itself, he chose otherwise. We surmise that Pope Sixtus V was also well aware of the significance of the Great Celestial Conjunction around 2012 and its association with the biblical End Times. To enhance this argument, it’s interesting to realize that the coat of arms of Pope Sixtus V contained an eight-pointed cross above four stacked mountains (or hills). The coat of arms of Sixtus was sometimes also depicted with three instead of four hills. As explained before, in ancient Egypt and freemasonry mountains, pillars and clouds all represent the Milky Way. The four mountains in Pope Sixtus coat of arms could therefore represent the four Great Celestial Conjunctions or the four Milky Way Equinox/Solstice alignments that occur in a Great Year! Santa Maria Piazza del Popolo (coat of arms of Pope Sixtus V), eight-pointed cross over the four mountains. Pope Sixtus V used the eight-pointed cross in abundance in architectures and; in many cases he even placed the four-pointed Christian cross on top of an eight-pointed cross! The obelisk at Piazza di Giovanni, for instance, was adorned with both a four and eight-pointed cross by Pope Sixtus V. It was also a reference to this coat of arms! The four Great Celestial Conjunctions in a Great Year are the four mergers of the two superimposed four-pointed crosses (Earth Cross and Galactic Cross) to form a single four-pointed cross! Obelisk at Piazza di Giovanni, four-pointed cross on top of the eight-pointed cross! Although a symbol of the Great Celestial Conjunction, this obelisk no longer aligns with the Winter Solstice Sun as viewed from the Vatican. We therefore suggest that the eight-pointed cross at St. Peter’s Square symbolically represents a Great Celestial Conjunction. 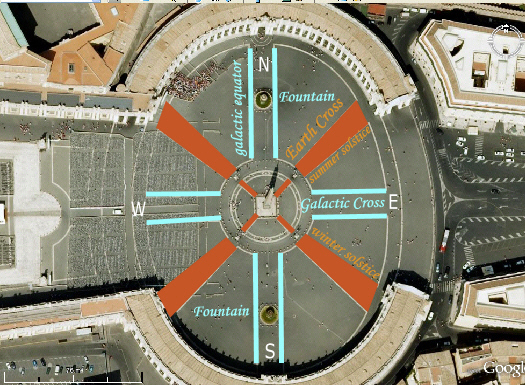 The axis on which the two fountains at St. Peter’s Square reside is the Galactic Equator of the Milky Way since the Milky Was is associated with water. The cardinal direction of this Galactic Equator axis corresponds with the Milky Way that straddles the East horizon from North to South. The esoteric significance of the Summer Solstice alignment of St. Peter’s Square obelisk with the obelisk at the Piazza del Popolo is that it symbolizes a Summer Solstice Galactic Alignment. 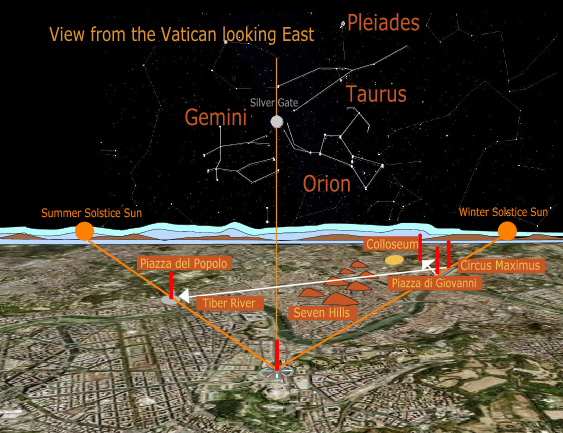 Since the sky chart over St. Peter’s Square with the Pleiades residing over the Seven Hills symbolizes the Silver Gate, we postulate that the Vatican alignments represent a Summer Solstice Galactic Alignment at the Silver Gate. This alignment occurs right now in era 2012! Summer and Winter Solstice alignments as viewed from St. Peter’s Square. The white arrows show the displacements of the obelisks from Circus Maximus by Pope Sixtus V.